Father Froilan Rivera celebrates his first TLM at Divine Mercy Parish. On April 25, 2008 Rev. Fr. Froilan Rivera of the Prelature of Infanta Nullius celebrated his first Mass in the extraordinary form of the Roman rite. Fr. Froi, as friends called him, was born in Aurora province. He entered seminary in early 80's at St. Francis de Sales Major Seminary in Lipa, Batangas where he finished his degree in A.B. Philosophy and studied his M.A. in Theology at Divine Word Seminary in Tagaytay City while staying at The Tahanan ng Mabuting Pastol in the Diocese of Imus. He is currently the spiritual director (2nd term) of St. Joseph Formation House in Quezon City. On April 25, Feast of St. Mark the Evangelist (Rogation Day), right after the Mass, on his return to the sacristy, Fr. Froi imparted his blessing since his ordination to the faithful using the form Benedictio Dei omnipotentis, etc. On April 25, 2008 on the feast of St. Mark, the Evangelist, Fr. Abe Arganiosa, CRS Celebrated the Extrordinary Form of the Mass as part of the culminating activity of the Somascan Sisters who were having their retreat. Fr. Abe served as their retreat master and he invited them to experience the TLM. Starting on Sunday April 27, 2008 Fr. Abe will celebrate TLM at the St. Jerome Emiliani Chapel, Piot, Sorsogon City at 10:00 a.m. This will be the new weekly TLM Schedule in Sorsogon. Our TLM will now be held every Sunday due to the request of some members of the Oath Alliance of Two Hearts and other faithful. The Mass will be held not on an incovenient time but on a prime time! Let's Thank God for this grace. The Latin Mass community of the Parish of the Lord of the Divine Mercy was honored to have Father Abe Arganiosa, CRS celebrate his 3rd Mass according to the extraordinary form yesterday morning, the 12th of April. Father Arganiosa, whom we fondly call Father Abe, is one of the very few priests we know who desires to learn the Tridentine Mass not only out of obedience to the Holy Father, but also out of his great love and devotion for the Mass, whether it is in the ordinary or extraordinary usage. Through reading the Vicar of Christ's apostolic letter Summorum Pontificum given motu proprio, he saw its wisdom and relevance to him as a priest. Summorum Pontificum after all, as Father Zuhlsdorf would say, primarily is for priests. Being new to TLM, it was evident that Father Abe was struggling with the rubrics, but despite of this, his enthusiasm was strong and his love and reverence to every single gesture, movements and prayer was clearly seen. Congratulations Father Abe! A personal account of Father Abe is posted in his blog the Splendor of the Church. The New Liturgical Movement blog has posted several photographs of altar arrangements for the celebration of the ordinary form that is being reintroduced by Pope Benedict XVI. Last Sunday, the Feast of the Divine Mercy, I took a photograph of the altar in the Parish of the Lord of the Divine Mercy while the Mass in the ordinary form was being celebrated. The celebrant was Fr. Michell Joe Zerrudo, a young priest who has regularly celebrated the Traditional Mass since 1997 and who has been the parish priest of PLDM since 2007. Since September 2007, Fr. Zerrudo has effectively transformed PLDM into a biritual parish. Daily Low Mass and Sunday and Feast Day Missa Cantadas according to the 1962 Missal are celebrated in addition to the regular daily and Sunday schedule of Novus Ordo Masses, the latter celebrated with worthy vestments and on a “Benedictine” altar. The decision to celebrate Holy Week according to the 1962 Missal was made shortly before Passion Sunday. As far as we knew, no regular parish in the Philippines had celebrated Holy Week according to the classical Roman Rite since 1970 – and now, we had little more than a week to plan everything! Fortunately, we had the advice of the elderly Msgr. Moises Andrade, a great lover of the Traditional liturgy, and an ex-SSPX seminarian by the name of Mark Bunag to guide us and to act as MC. Our Sunday TLM cantor, Felix Valenzuela, had a great love and knowledge of Gregorian chant and was able to train other singers in time to form a schola for Holy Week. I myself acted as crucifer and as one of the main servers during the ceremonies, while helping to visualize and plan the ceremonies beforehand. The “Traditional community” and the regular parishioners of PLDM had led separate lives (so to speak) up to this time, save for the fact that they were served by the same priest. Since this Holy Week was going to be for both communities, a modus vivendi to enable the regular parishioners not to feel left out was reached. Roles were assigned to representatives of both communities: for example, after the chanting of each Latin reading from the Epistle side of the sanctuary, an English translation of the same was read from a side lectern (outside the sanctuary) by one of the regular lay lectors. While most of the propers were chanted by the schola for the Traditional Mass, the regular parish choirs sang a few of the propers as well Latin hymns for the Communion rites. Finally, for the Easter Vigil, the schola and the parish choirs sang as one. Servers of both the TLM and the regular parish NOM joined forces for the ceremonies of Holy Week. Given that many of the latter group had not even seen a Traditional Mass before, this was no mean feat. The parish office also printed hundreds of special missalettes with English translations of the ceremonies. Since not everybody could have a missalette, the text of some of the ceremonies were also projected on a screen to the right of the altar. Palm Sunday’s procession and principal Mass was celebrated in the morning according to the 1962 Missal, but with the Gloria Laus ceremony at the door of the church inserted into the rites. (This ceremony had been removed in 1955.) Since the choir for the procession was made up of young girls dressed as angels, the decision was made to make them sing only selected antiphons (in Latin) from the processional chants, using simplified melodies belonging to the Tridentine-era Philippine tradition of sacred music. This was one of the “compromises” that had been decided on, so that both communities could take part in the Rites. In accordance with centuries-old Philippine tradition, the churchgoers brought their own palms, which Fr. Zerrudo blessed by going around the whole church sprinkling the palms with holy water; only coconut leaf crosses (to be affixed to the palms) were distributed at the altar rail during the blessing of palms prior to the procession. A few minutes after this Mass ended, Fr. Zerrudo celebrated a second Palm Sunday Mass according to the 1970 Missal (in English), but ad orientem and with a glorious Roman chasuble. Every night from Palm Sunday to Holy Wednesday, penitential processions with life-sized statues of saints, of the Blessed Virgin Mary, and of the Lord in His Passion were held in the streets surrounding the parish church. Maundy Thursday and Good Friday are national holidays in the Philippines, and as in other parishes, the PLDM church was packed to overflowing for the principal rites. It was a relief to note that the use of Latin had not scared people away, and even attracted additional attendees. The foot washing was no mere ceremony: the twelve viri selecti (or apostoles, as we call them) were very poor men whose legs were encrusted with dirt and mud, and their right feet really had to be scrubbed with soap before being kissed. For a quarter of an hour, these men were the most important in the whole parish. Afterwards, they had the honor of holding the canopy for the Blessed Sacrament during the procession to the altar of repose. After the procession to the altar of repose, people began leaving the Church. I had to run to a lectern to tell people that the ceremonies were not yet over, whereupon the crowd obediently went back to their seats. Soon afterwards, the Stripping of the Altars was held. The night was spent by the faithful doing the traditional Visita Iglesia (visiting the traditional seven churches on Maundy Thursday night) to venerate the Blessed Sacrament in various altars of repose. Good Friday was the best-attended ceremony, with the crowd flowing out of the church and way into the streets around it. The Passion was chanted by Fr. Zerrudo, Fr. Froilan Rivera (of the Prelature of Infanta) and the cantor Felix Valenzuela (who sang the role of Cronista). In the Philippines it has ever been the custom for laymen (even prior to Vatican II) to act as deacons of the Passion and even to vest as deacon and/or subdeacon for the chanting of the Passion. This was due to the severe shortage of clergy with which our country has always been afflicted. In consultation with Msgr. Moises Andrade, we decided to follow this custom in the case of the Cronista as we couldn’t find a cleric able to take on this role. However, the cantor vested only in cassock and surplice, not in alb (as would have been the practice prior to Vatican II). Fr. Rivera was completely new to the Traditional Rite, but after a whole night of rehearsing and of rigorous tutoring by Mr. Valenzuela, was able to sing the role of Synagoga very well. Initially, we servers tried to get the people to do the traditional genuflection before kissing the feet of the Crucified. However, due to the size of the crowd (there were nearly a thousand people that day) a surge forward to venerate the Cross was inevitable, depriving the people in front of any space in which to genuflect. To our amazement, the people in front – without any prompting – spontaneously began to crawl on their knees to the cross. This had the effect of slowing down the surge while allowing people to express their reverence to the cross. Many people also left their footwear at the pews and went barefoot. The adoration of the Cross took so long that, after singing all the prescribed chants in the 1961 Liber Usualis, the schola still had the time -- and the excuse -- to sing the Vexilla Regis (whose liturgical use in Good Friday disappeared in 1955). After Vexilla had been sung, we told the large number of people still crawling on their knees to go back to their seats and to adore the Cross after Communion. Some went back, but others continued to crawl to the Cross – how can you stop such piety? And so the schola chanted another Crucem Tuam, after which a substantial period of silence ensued to let some more people adore the Cross. In a traditional Philippine Holy Week, all of Good Friday is taken up in devotional and paraliturgical ceremonies, and PLDM was no exception to this. The only difference is that the priest vested in black cope rather than in red. While some people resumed venerating the Cross after the service of Good Friday, a penitential procession with the purple-robed “Santo Entierro” (a recumbent statue of the Dead Christ) accompanied by richly vested statues of the Mater Dolorosa and the saints of the Passion (SS. John, Peter, Mary Magdalene, Mary Salome and others) started on its way. After the long procession ended at nearly nine in the evening, the Santo Entierro was venerated inside the church, to be followed almost immediately by a second procession with the Mater Dolorosa (the “Soledad” procession) with all the participants including Fr. Zerrudo going barefoot along the asphalt roads. The first procession had commemorated the Burial of Christ; the second procession commemorated the Blessed Virgin Mary, alone and grief-stricken, going home to St. John. The second procession ended with the recitation of the Stabat Mater and the incensing of the Mater Dolorosa. The night ended with Fr. Zerrudo hearing confessions. Easter Vigil began at 12:15 AM of Sunday and ended at quarter to four in the morning. Because of the lateness of the hour, there were markedly less people in attendance. 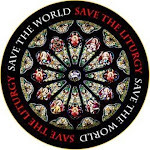 Nevertheless, the regular lay lectors turned out in full force, such that after the chanting of each Prophesy (and of the Epistle) in Latin, there was a different lay lector to read the English translation. [Remember the "modus vivendi" I had written about.] We had the joy of witnessing the reception of a convert into the Catholic Church, who had the additional blessing of being baptized according to the Traditional Roman Rite. Fifteen minutes after the Vigil ended, the last major ceremony of a Philippine Holy Week began: the "Salubong" (literally “Welcome” or "Encounter"). The Salubong began with two processions – one of men accompanying the statue of the Risen Christ, and the other of women accompanying a statue of the Blessed Virgin veiled in black – meeting in front of the church. To the sound of brass bands and the cheers of the large crowd, the two statues met, whereupon a young girl dressed as an angel was lowered from a crane onto the statue of the Virgin. The “angel” lifted the black veil, revealing the Virgin Mary all radiant in white and blue. Why the Virgin, and not Mary Magdalene? This is because Philippine piety has always considered the Mother of God to be the first witness of the Resurrection, and this belief is enshrined in the Salubong ceremony. In 1971, the Congregation for Divine Worship allowed the first morning Mass of Easter in the Philippines to have the “Salubong” as its Entrance Rite. And so Salubong was followed by Fr. Zerrudo intoning the Gloria and the celebration of a Novus Ordo (English, ad populum, but very reverent) at an altar set up in front of the doors of the church. With that, Holy Week 2008 ended -- and what a historic week it was for us! Nevertheless, judging from the feedback we got, we had succeeded in our main task: to bring the entire parish community to a deeper appreciation for the Traditional Roman Rite. While not a few were perplexed by the length and intensity of the rites and the use of Latin (a common question being: "will the sermon also be in Latin?" -- asked not in jest, but in all earnestness), others were loud in their appreciation for the reverence, solemnity and grandeur of the rites. I remember, walking by the side of the church after the rites of Maundy Thursday, hearing a woman saying aloud: "napaka-solemn, napaka-ganda" (so solemn, so beautiful!). And lest anybody wonder about the impact of the schola on everyone present: they got an invitation to sing at the birthday Mass of the local vice mayor! Some of the photos i took during this Holy Week break. "For an extraordinary week, PLDM goes extraordinary," Rev. Fr. Michell Joe Zerrudo said in his column, Tinig ng Pastol, in Daloy, the official newsletter of the Parish of the Lord of the Divine Mercy. It was truly an extraordinary week, from Palm Sunday, the parish community with the Latin Mass Society of St. Joseph celebrated Palm Sunday using the extraordinary form of the Roman Rite, the Missal of Pope Pius V reissued by Blessed Pope John XXIII in 1962. The traditional Palm Sunday solemn litugy started with the blessing and procession of palms and after which the solemn celebration of Holy Sacrifice of the Mass. On Maundy Thursday, the first day of the Easter Triduum, commemorates the Institution of the Holy Eucharist at the Last Supper and the Ordination of the Holy Apostles was a Mass of joy and thanksgiving. The PLDM choir together with the Latin Mass Society of St. Joseph choir with great joy sung the Gloria with bells ringing giving glory and praise to God. The glorious celebration seems to have taken a slower pace when Fr. Zerrudo began changing his clothes, exchanging his beautiful roman chasuble with that of an ordinary cloth, knelt before the twelve scavengers to wash their feet. "Mandatum novum do vobis: ut diligatis invicem, sicut dilexi vos, dicit Dominus. Beati immaculati in via: qui ambulant in lege Domini. Mandatum novum..." A new commandment I give unto you: That you love one another, as I have loved you, saith the Lord. Blessed are the undefiled in the way: who walk in the law of the Lord. A new commandment ." After communion, the Sacred Hosts were vacated and transfered in a solemn procession to the Altar of Repose or Holy Sepulchre where it will remain until Good Friday. The commemoration ended with the stripping of the altar, "Diviserunt sibi vestimenta mea: et super vestem meam miserunt sortem," They parted my garments amongst them, and upon my vesture they cast lots. The Good Friday's solemn liturgy began with Father Zerrudo and Father Rivera as deacon, prostrating themselves before the stripped altar. It then followed by readings from the scripture, a prayer followed by St. John's Passion narrative. During the third part of the sacred liturgy, came the unveiling and adoration of cross by Father Zerrudo, Father Rivera and the rest of the faithful assisting at the sacred liturgy. To show their deep love, adoration and reverence to the our Lord Jesus, the people walked with their knees towards the Holy Cross. The Blessing of Fire and lighting of the Paschal Candle began the Easter Vigil solemn liturgy. As the whole church was surrounded by darkness, the Paschal Candle, symbolizing Christ, the Light of the World, was the only light seen and as it processed towards the altar, it became to source of light of the faithful. "Lumen Christi!" Father Zerrudo exclaims thrice. As Father reached the Altar, he read the Paschal Proclamation: "Exsultet iam angelica turba caelorum" Let the angelic choirs of Heaven now rejoice... The lessons were then read and after which the first part Litany of the Saints were chanted. The Blessing of the Baptismal Water came after and a catechumen was baptized and confirmed after which the rest of the faithful led by Father Zerrudo renewed their baptismal promises. Then after the second part of the Litany of the Saints came the Holy Sacrifice of Mass starting with the Kyrie and incensation of the Altar. Congratulations and thanks to everyone involved in this extraordinary endeavor for allowing us to reflect and meditate upon the sacred passion, sacrifice and victory of our Lord amidst a world that takes for granted and looks at Holy Week ordinarily as any other week. On March 16, 2008, Palm Sunday, Father Michell Joe Zerrudo, pastor of the Parish of the Lord of the Divine Mercy and his parishioners turned towards the Lord and celebrated Palm Sunday facing the liturgical east together using the Missal of Pope Paul VI in the vernacular. Father Zerrudo, in beautiful traditional vestments, himself an exorcist and liturgist, teaches his parishioners through example the essence, the beauty and spirituality of catholic ad orientem worship. The Parish of the Lord of the Divine Mercy in Sikatuna Village, Quezon City, the Latin Mass Society of St. Joseph and Father Michell Joe Zerrudo will have a Holy Week according to the Extraordinary Form of the Roman Rite. Below is the schedule for the Tridentine Mass. Updated: There will be no Easter Day Mass (1:30 PM) in the Extraordinary Form as there is a Vigil Mass in the Extraordinary Form.